Escape. Be more connected with the mountains. Ride untouched snow. 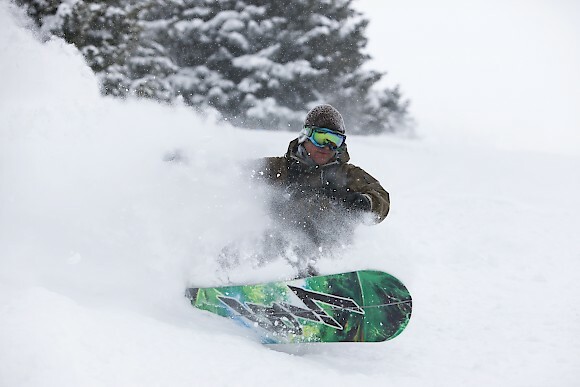 If you’re into riding powder, you’ll understand the quest for freshies. A chance to get away from it all, it’s no surprise that finding ways of getting to remote lines is part of the quest. That is what led me to splitboarding. What I didn’t expect is how much I’ve come to enjoy the walk up almost as much as the ride down, and how the exercise brings its own reward. The nature of splitboarding really means immersing yourself in the landscape, and always leads to a sense of having it all to yourself. Just you and your buddies enjoying the conditions, undisturbed and at your own pace – and that’s all before you drop in. The past few years has seen a new wave of riders looking to go bigger and further; away from the crowded pistes and into the pristine backcountry for fresh tracks and more extreme terrain. Splitboarding, a relatively young sport, is now allowing snowboarders to rival ski tourers and also use skins to travel up-hill and get off the beaten track. Far from a new concept, there is evidence of skis being used as a form of transport going back 6000 years – actually, according to Roland Hunford in his book “Two Planks and a Passion”, there is evidence of Cro-Magon man using skis or ski like devices 22,000 years ago. The recent surge in popularity of off-piste skiing and snowboarding has definitely driven a return to skiing’s roots as a form of transport. These days alpine or downhill skiing still dominates over Nordic style skiing, with the adrenalin rush of charging downhill bringing a number of people to the sport as a recreational pastime since the late 1800’s. With the convenience of mechanical chairlifts and the ease of getting to the top of peaks, the development of skiing into the leisure and sporting pursuit it is today bears testament to it’s elemental appeal. Almost certainly influenced by the ever-increasing stream of content on amazing backcountry destinations covered in perfect powder snow, many have been inspired to venture further from the piste. This not only means fresh snow doesn’t last as long on a bluebird morning, but it is increasingly harder to get away from the crowds and get the full undisturbed mountain experience. This awareness, and the visibility of extreme sports, has prompted the return of skiing to its touring roots. With snowboarders not wanting skiers to have all the fun, great advances in the quality and choice of splitboard equipment now allows snowboarders to search for that untouched powder just as easily! Not too long ago, snowboarders would have to arduously snow-shoe and look on with jealousy as their skier friends travelled uphill much more quickly and efficiently with the help of skins. The invention of splitboards (most simply explained as a snowboard that splits into two skis with free heel bindings for walking uphill) has levelled the playing field and snowboarders can now enjoy as many runs as skiers each day touring! 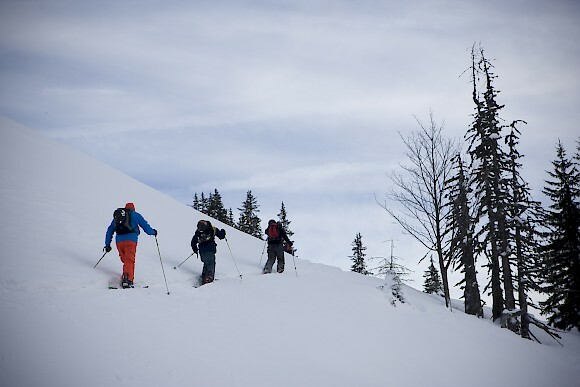 The most common misconception about splitboarding is that you need to be able to ski to go. In fact, what’s more important is your level of fitness as it can be quite physically demanding. However, the length and difficulty of a tour can be adjusted depending on your ability – and lets face it, the rewards definitely outweigh the challenge! For anyone confident riding powder or an already competent backcountry rider, splitboarding provides the chance to access the true backcountry. We can help you organise gear rental from The Woods and guiding from local schools if you’d like to give it a go and really earn those turns!